The United States Military Academy has been educating, training, and inspiring leaders of character for our United States Army and for the nation for more than 200 years. West Point provides a 47-month leader-development program steeped in academic rigor, military discipline, and physical challenges, all built upon a moral-ethical foundation. 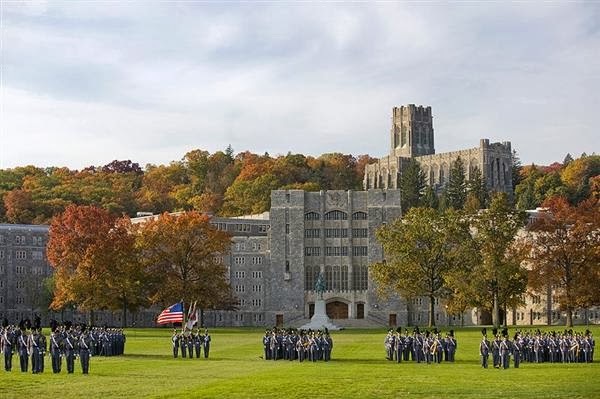 The academy is an internationally recognized institution for academic, military and physical excellence, and we are proud that today's cadets will become tomorrow's military, public and private-sector leaders.West Point's purpose is to produce leaders of character who are prepared to provide selfless service to our Army and the nation. West Point provides a broad-based and balanced curriculum to ensure graduates acquire knowledge, skills, and attributes necessary for them to effectively address the complex and uncertain challenges they will face in their personal and professional lives. When students enter the United States Military Academy at West Point, they are beginning a profession. Career development starts on the first day; everything cadets experience is focused on developing them as leaders of character who will serve as officers in America's Army upon graduation, when they are commissioned as second lieutenants in the U.S. Army. As they begin their military careers, they become leaders of Soldiers, and each new promotion brings additional responsibility and increased opportunity. West Point strives to admit the best and brightest each year to ensure that the classrooms are places of intellectual rigor and stimulation, places where knowledge passes not just from instructor to cadet, but from cadet to cadet as well. West Point's Academic Program serves as a foundation for the development of critical thinking and creative problem-solving skills. It includes a substantive set of fully integrated core courses that, together, provide an appropriate balance between technical topics and the humanities. Cadets choose their areas of depth from more than 40 academic majors that span a broad spectrum of academic disciplines. The academic curriculum culminates with an integrative experience that is often an interdisciplinary and team-based project. Through the Senior Capstone experience, students draw upon and apply knowledge in their chosen majors as well as knowledge gained throughout the course of their studies. Often these projects provide real answers to real-world problems, result in presentations at academic conferences, and bring national recognition. Upon graduation, all cadets receive a Bachelor of Science degree and are fully prepared to meet the intellectual requirements of a leader in today's army. The Physical Program at West Point includes both physical education classes and competitive athletics. It contributes to mental and physical fitness and allows the cadet to achieve the highest levels of physical development through a program that emphasizes a lifelong pursuit of personal fitness. The physical education curriculum spans all four years, and physical education class grades are incorporated into the cadet grade point average, highlighting the importance of physical fitness in the Army. Every cadet must participate in competitive sports throughout the academic year, whether in varsity intercollegiate athletics, intercollegiate clubs, or company athletics. The program challenges cadets every day but is widely regarded as both rewarding and enjoyable. While academic courses are the building blocks of most typical universities, career development at West Point is geared toward the cadet's goal of being an officer in the United States Army, so military discipline and training are paramount to their officer development. Cadets are immersed from day one in a military environment where they are organized in companies and serve in leadership positions within the Corps of Cadets. The heart of the military training takes place during the summer. The basic Soldier skills of rifle marksmanship, land navigation, and close combat are but the underpinnings of each cadet's initial training the first summer; by graduation every cadet has participated in small-unit leadership training; attended military schools such as Airborne and Air Assault; served as senior leadership to junior cadets' summer training; and interned as an office in active duty units across the globe. Each summer of training builds the leadership skills of the previous, so that by graduation each cadet is prepared to lead Soldiers and serve our nation. No matter what major course of study they choose, cadets graduate with the knowledge, confidence, and ability to be successful in their careers.